Veeam® has a steady stream of new customers coming from the ranks of former Dell EMC users. Why? The 24.7.365 Availability today’s businesses require with the ability to restore any IT service running in the hybrid cloud within seconds and minutes. Replacing legacy backup is a key enabler of digital transformation, business continuity and increased agility. Veeam dramatically improves attainment of service level agreements (SLAs), increases reliability and reduces operational complexity resulting in measurable ROI and lower TCO. Join thousands of others by switching to Veeam and get THE Availability solution designed from the ground up to protect applications and data wherever they are — on-premises or in the Cloud, on laptops or desktops, virtual machines or physical servers — anywhere! Check out the top seven reasons to switch to Veeam today! The modern, highly virtualized hybrid cloud world demands a specifically designed solution. Meet aggressive SLAs for IT service recovery that can be measured in seconds and minutes rather than the hours and days often required by legacy technologies, when you switch to Veeam. According to IDC, recovery time and point objective (RTPO™) SLAs are met 91% of the time by Veeam customers, compared to only 70.7% with their previous legacy provider. Dell EMC’s data protection portfolio has been assembled together from various acquisitions throughout the decades. Its key products were developed in the 1990s when RTOs and RPOs were just suggestions. Veeam, on the other hand, was built from the ground up to provide RTPOs of 15 minutes or less for ALL applications and data. 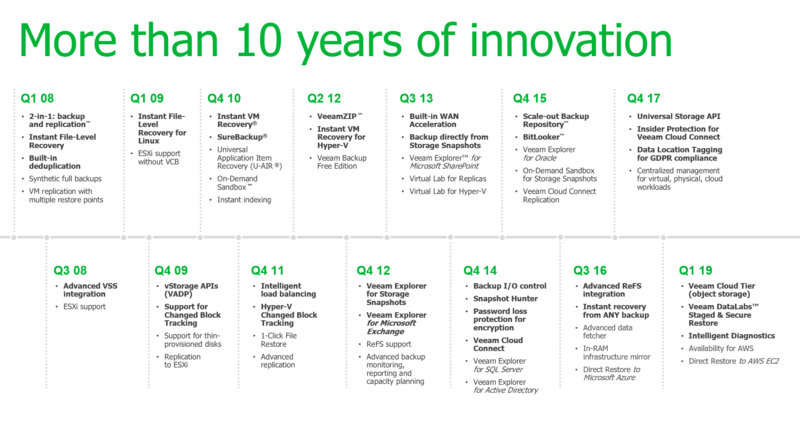 With the most comprehensive and forward-looking cloud vision in the industry, support of the latest platforms and a proven history of being first to deliver market-defining capabilities, it is clear that Veeam is an innovation leader. Dell EMC’s data protection solutions still lack many of the key capabilities that Veeam invented, such as SureBackup® and SureReplica, Virtual Labs, Instant VM Recovery® without limitations, freedom from hardware dependencies and many others! Veeam is a privately held rocket ship on target to reach $1 billion in yearly sales by 2018 with freedom to innovate, making it one of the fastest growing enterprise software companies today. It is a top choice among data protection and Availability solutions as recognized by IDC and Ovum. Veeam’s forward momentum is unstoppable, adding more than 4,000 new customers every month and new powerful capabilities with every release while Dell EMC imposes mass layoffs and attempts to integrate multiple products. Veeam gets you up and running in minutes with a near-effortless scalable architecture and deployment, combined with a straightforward approach to licensing. Veeam users are freed up for more productive tasks, with no agents to protect virtual workloads or applications. In fact, IDC found that two out of three Veeam customers spend less time managing their Availability infrastructure! Veeam’s cohesive, integrated approach to backup, replication and disaster recovery is the clear choice over the multiple Dell EMC backup products that impose confusing licensing requirements and numerous agents, add-ins and separately licensed products. Veeam’s capabilities are unrivaled by Dell EMC’s portfolio. This includes advanced hardware independent replication capabilities that enable near-continuous data Availability, an innovative software-defined Scale-out Backup Repository™, built-in WAN acceleration, industry-leading features such as instant, agentless recovery for tier-1 Microsoft applications, secure end-to-end encryption with lost password protection and deep integration with leading primary storage arrays. Dell EMC’s legacy data protection portfolio can leave you vulnerable to potential data corruption and restore failures, lacking critical automated backup testing and recovery verification for 100% of your workloads. Veeam enables infrastructure resilience through monitoring, reporting and testing. 9 out of 10 Veeam customers WOULD recommend Veeam to their peers, giving us a Net Promoter Score (NPS) of more than double the industry average. Our ease of use, product features and functionality, sales effectiveness and technical support leave Veeam customers overwhelmingly satisfied. Former Dell EMC users tell us they are switching to Veeam for the stable, hybrid cloud-focused, high performance that Dell EMC couldn’t deliver. According to the Storage magazine/SearchStorage.com Quality Awards, Dell EMC’s midrange backup and recovery software comes in last in initial product quality and next to last in support. It isn’t hard to see why so many organizations are making the switch. Over 50,000 companies switched to Veeam in the last 12 months – many from Dell EMC! This Promotional Offer is open to certain end-user customer who either currently does not own, or has not purchased a Veeam Software Product in the past. This Offer includes a discounted savings on new licenses of Veeam Availability Suite or Veeam Backup & Replication Enterprise or Enterprise Plus editions only. Savings amount may be variable based on environment size and regional currencies. For promo eligibility, the end user customers must purchase new License SKUs and the corresponding promo prepaid maintenance SKUs in the same quantity under the same ordering document. This Offer includes public sector, internal partner use and educations licenses. This Offer does not apply to any other Veeam Software products. An additional two (2) years of pre-paid maintenance may be required for eligibility for some end user customers. Please note that this Offer does not include your support / maintenance renewals; your annual renewal fees will be calculated based on the MSRP of the Enterprise or Enterprise Plus edition at the time of renewal.